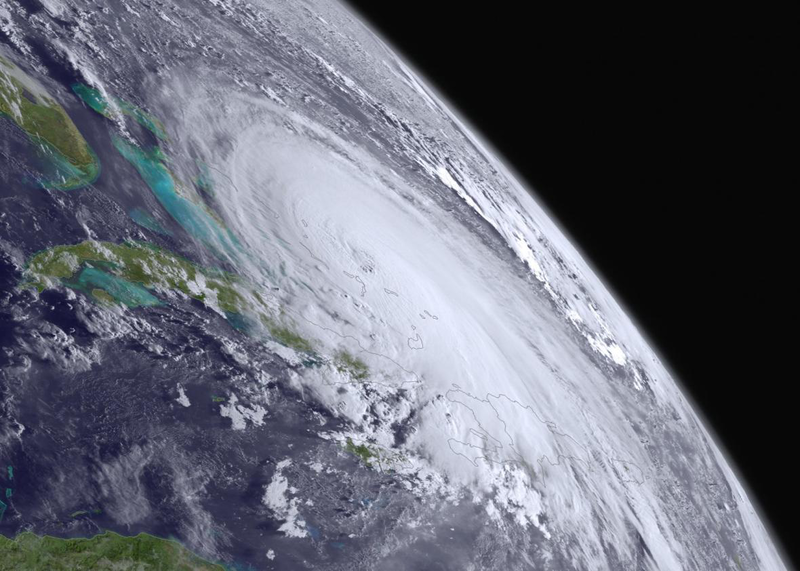 Hurricane Joaquin won’t hit U.S., but rain and flooding to come. Hurricane Joaquin, on Thursday, near the Bahamas. The threat of a U.S. landfall from this year’s strongest hurricane appears to be waning. Overnight model trends as well as the latest official forecast from the National Hurricane Center show that Hurricane Joaquin—still a powerful category 4 storm in the central Bahamas—will likely take a course out to sea over the next few days, steering away from the U.S. mainland. On Twitter, the Washington Post’s Capital Weather Gang said the recent model trends and narrowing window for another dramatic shift back toward the coast means it’s “game over” for any appreciable direct threat to the Mid-Atlantic states from Joaquin. 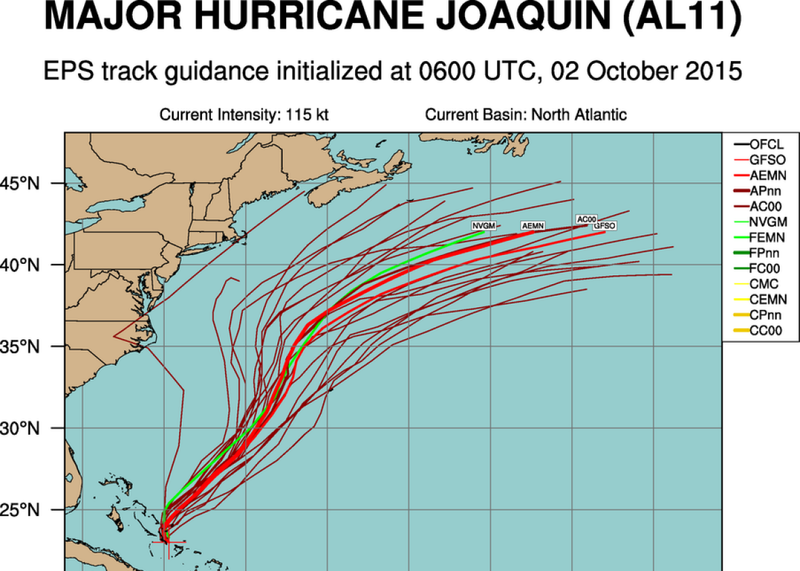 In a forecast update, the typically cautious National Hurricane Center said “we are becoming optimistic that the Carolinas and the Mid-Atlantic states will avoid the direct effects from Joaquin.” Its latest “cone of uncertainty”—a broader forecast track that factors in historical error—shows no land areas in Joaquin’s likely path, besides Bermuda and Newfoundland. There’s very little chance remaining that Hurricane Joaquin will make a direct U.S. landfall, but hurricanes like this can still cause havoc from afar. That doesn’t mean Joaquin’s threat to the United States is completely over—a hurricane of Joaquin’s stature doesn’t need to make a direct landfall to cause issues. Significant coastal flooding is likely from the Carolinas to Massachusetts with each high tide cycle for the next two or three days as the relatively close proximity of Joaquin, an upper-level low over the Southeast and a mass of Canadian high pressure funnel strong winds toward the coast. In Cape May, N.J., for example, storm surge is currently approaching three feet—higher than the level recorded during Hurricane Irene’s landfall in 2011. Combined with the nearly 20-foot waves just offshore, that’s a recipe for significant beach erosion that will threaten homes and boardwalks. National Weather Service forecaster Gary Szatkowski—a meteorological legend for his work during Hurricane Sandy—predicted Friday would be a “truly wicked day” at the New Jersey shore. This same story could be repeated for places like Boston Harbor, Norfolk, Virginia, and the Outer Banks of North Carolina. On top of this coastal threat, heavy rainfall well inland across the Southeast could be historic. Latest projections show 10 to 20 inches of rain is possible in the next three days across South Carolina, which would almost assuredly be enough to break the all-time October rainfall record in the span of just a weekend. The National Weather Service in Greenville-Spartanburg, S.C. has warned of “historic” flooding in western parts of the state. Meanwhile, the Bahamas continues to get battered. It’s now been nearly two days that Joaquin has remained stalled out over the island chain, though thankfully in one of its least populated regions. Reports indicate significant flooding has occurred, though a complete survey of damage and impact isn’t yet possible because the storm is still ongoing. Joaquin is now the fourth-most powerful hurricane to affect the Bahamas in its history, going back in the hurricane data archives to 1850.